On the hazy floor of the speakeasies, twelve girls dance until they drop. No one is sure who they are, but it seems certain that they won't let any man get too close and that they watch out for each other. Their names are unknown, but most of the regulars refer to them as 'the princesses." The secret is that the girls are sisters. They escape from their home and their distant father at night and head out to dance under the watchful eye of their oldest sister Jo. But things do not remain footloose and fancy-free for long. The police are beginning to crack down on the establishments that are disobeying the rules of Prohibition. But even more frightening than the idea of jail is the fact that the girls' father has suddenly realized that they are of an age when they can be married off. 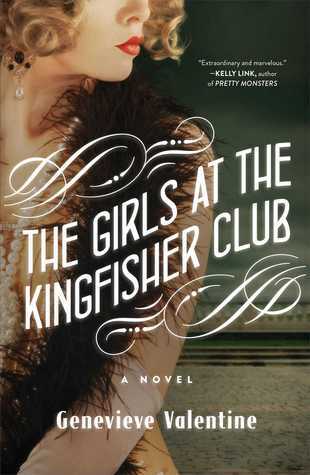 I started reading The Girls at the Kingfisher Club with a fair amount of hesitation. I knew that it would be difficult, if not impossible, to take twelve female characters who were close in age and make the reader feel as if they were distinct people. But author Genevieve Valentine brings these characters to life and makes us feel as if we know each one of them. Part of this is done through a wry sort of narration. Because siblings can know us better than anyone else, the narration will report something that one of the sister said or did. We then find out the truth that only one or two of the sisters know about that specific thing. We see the story through Jo's eyes. She is willing to sacrifice everything for her sisters - love, a happy future, even her freedom. Keeping her sisters safe has hardened her, but the love behind her choices is obvious. Jo is simultaneously the one who gives them their freedom to dance and the one who realizes that they must keep secrets and always be vigilant. Sometimes their safety takes precedence over happiness and Jo carries the heavy knowledge that her difficult choices distance her from her sisters in much the same way that they are distanced from their cruel father. The only downfall of this novel is the character of the girls' father. At times, it seems that he is being oblivious or cruel just for the sake of being that way. Since the girls barely know their father, the reader doesn't get insight into his past or his personality. There were moments when I had trouble believing that a real person would do the things that he does. But I suppose that is the necessity of fairytales, even those that are set in the Roaring 1920s. We must have a villain of unimaginable cruelty who our heroines must battle against. The Girls at the Kingfisher Club took a while to really hook me. But as I read, I really became invested in the lives of these twelve girls. As a sister, I admired their bond and the ways that they helped each other. You will take joy in their revels, relate to their bonds with each other, fear for their future, and hope that they each find the freedom to make their own choices and find happiness. Great review! It sounds like Valentine understands sibling relationships. If the story is told from the perspective of the sisters, I can see why the father's actions might appear incomprehensible. Most villains are more complex than the evil we know them for, but sometimes they are not, and maybe the novel portrays the father appropriately. I haven't read the novel, but I'm very curious about it now! I really enjoyed it. I think perhaps I was frustrated by the father because I couldn't find any possible rationale for his actions and I've read a few books in the past few months where the father was just cruel without explanation. My reserve copy of this book (that's been on hold for a couple of weeks) is finally being shipped to my library...which means I'll be reading this book this weekend. yay. :) I've always loved the fairy tale The Twelve Dancing Princesses and like the idea of a retelling of it set in the 1920s....one of my favorite time periods. This is such a unique setting for the Grimm's fairy tale. It sounds like fun- the roaring 20s is one of my favorite time periods too, particularly for the flapper dresses. I wish I could pull one of those off. I always loved the story of the 12 dancing princesses! I like the idea of a modern telling of the story but I'm super hesitant about the backdrop of Prohibition - every time I try reading about this period of time I'm annoyed. Maybe if this book drops itself in my path I'll give it a try but I'm not sure if I will search it out. I have to confess that I have not read too many books set during this time, but I can certainly understand your hesitation if you have read a lot of duds! This looks like a really cool retelling! I like the idea of the setting for this one. I also like the idea of still getting to know all the sisters despite the large number of them. I was so apprehensive because I thought there was no possible way she could really flesh out twelve characters. But I was wrong!! Yeah, so, The Twelve Dancing Princesses is my #2 all-time favorite fairy tale, AND I love anything 1920's, so I'm pretty sure I'm going to love this. And since this is a retelling, I'll probably be fine with the inexplicably nasty father, b/c fairy tales often have inexplicably nasty characters. Great review! I can't wait to read this one! That is so true. Villains in fairy tales are just terrible because that is what they do! Now I'm curious - what is your #1 favorite fairy tale? ?